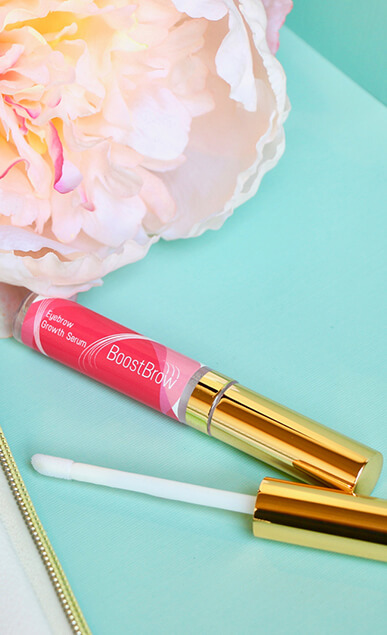 BoostBrow is the twin sister of our best selling product, BoostLash. 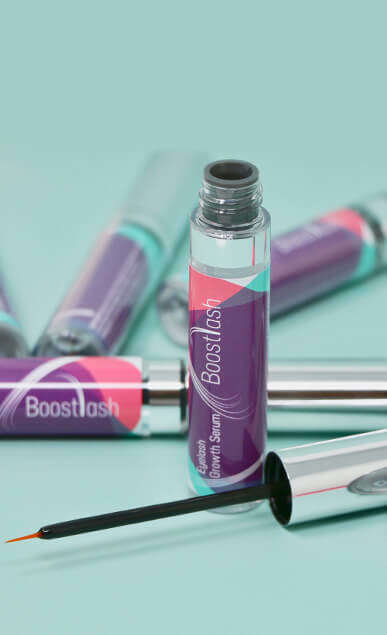 We don't recommend using BoostLash on your eyebrows, for sanitary reasons. 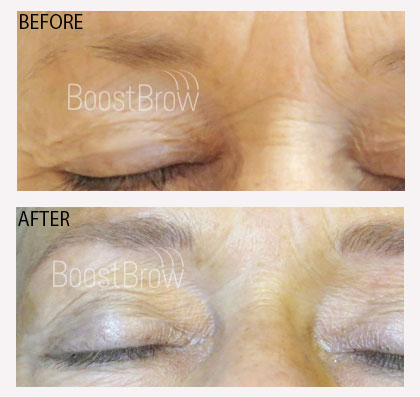 That's why we created BoostBrow for your convenitence; It is dedicated for eyebrow care only! The applicator has a fluffy round tip to cover more areas of your eyebrows. 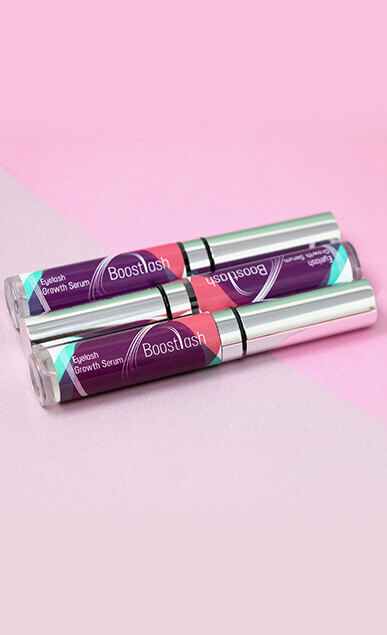 The ingredients are the same as BoostLash with altered percentage of certain components. The effects with this product are amazing, and the results are full of precision. You will notice real results sooner than you think. Positive changes can be seen after about 4 weeks or less. However please keep in mind that for the final results, the serum should be used regularly for 6-8 weeks. Each application helps to launch your beauty experience into new possibilities. The product is dedicated to brow care only. Consistency is the key with this product. Make sure to apply the serum daily for the best results. We recommend before bedtime and in the morning. 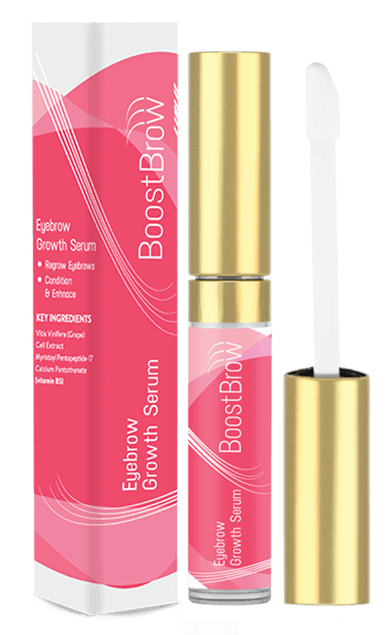 Applying BoostBROW serum on the thinning or bald areas of your eyebrows, creates the channel for active ingredients to be absorbed into your skin which goes onto your eyebrow(hair) follicles. The amazing result is that the weakened roots get nourished and get thicker, stronger and darker. 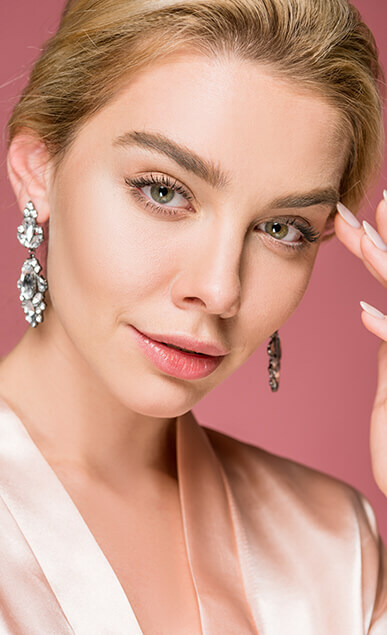 BoostBrow uses a peptide called Myristoyl Pentapeptide-17 to increase the proliferation of brows by strengthening and stimulating the cellular foundations from which the brows grow; much like watering and nourishing soil in order to grow a plant. 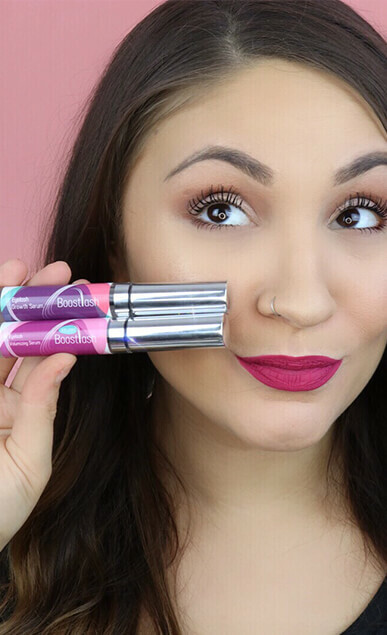 Specialists confirm that BoostBROW safe, free of allergies and doesn't cause any form of irritation. 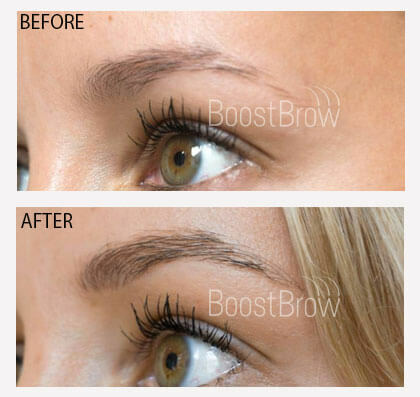 BoostBrow Is Safe, Effective and Delivers Real Results! check out these before/after images sent from real users like you! 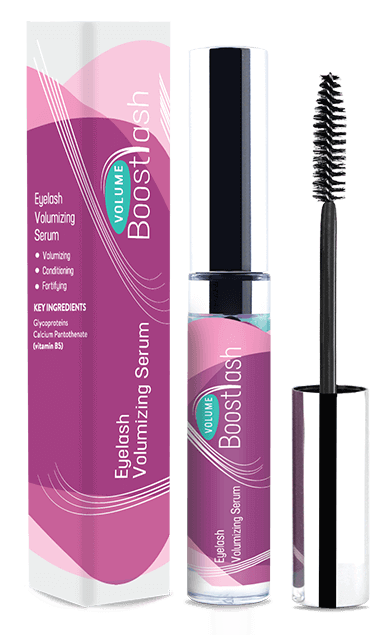 BoostVolume is a unique eyelash conditioner and volumizer that, with daily use, gives darker, stronger, more beautiful lashes. 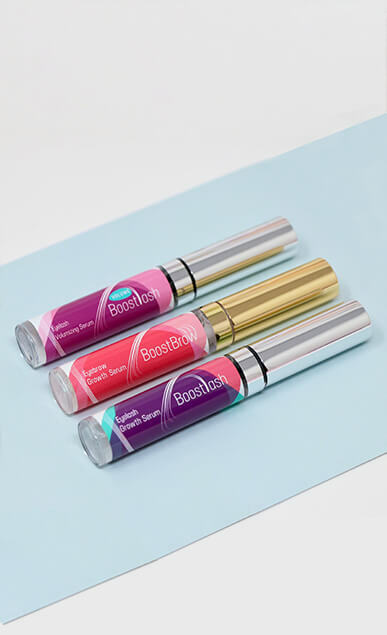 A unique product that is both a volumizing serum and a mascara primer, all in one magic 5ml cylinder. 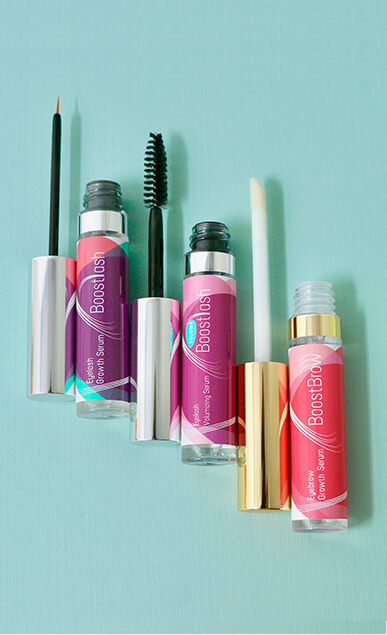 Using yeast-derived glycoproteins, BoostVOLUME magnifies and thickens lashes, as well as increasing flexibility and preventing breakage. This allows eyelash hair to reach its full potential. 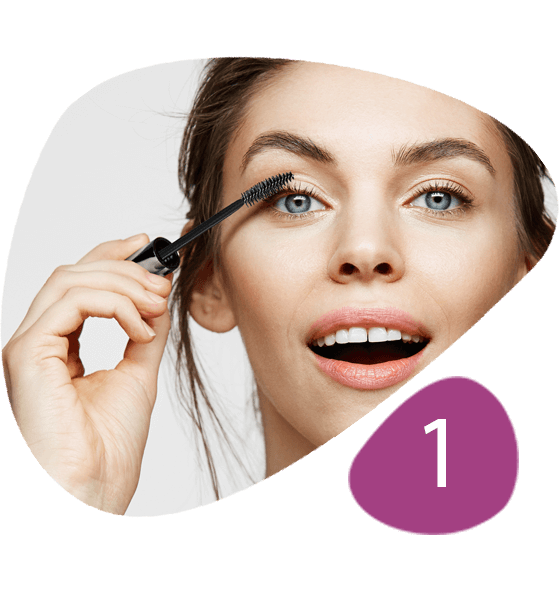 This product is ideal for anyone who wants to give their lashes a luscious boost and isn’t satisfied with the performance of their mascara alone or would like an alternative to wearing mascara altogether. 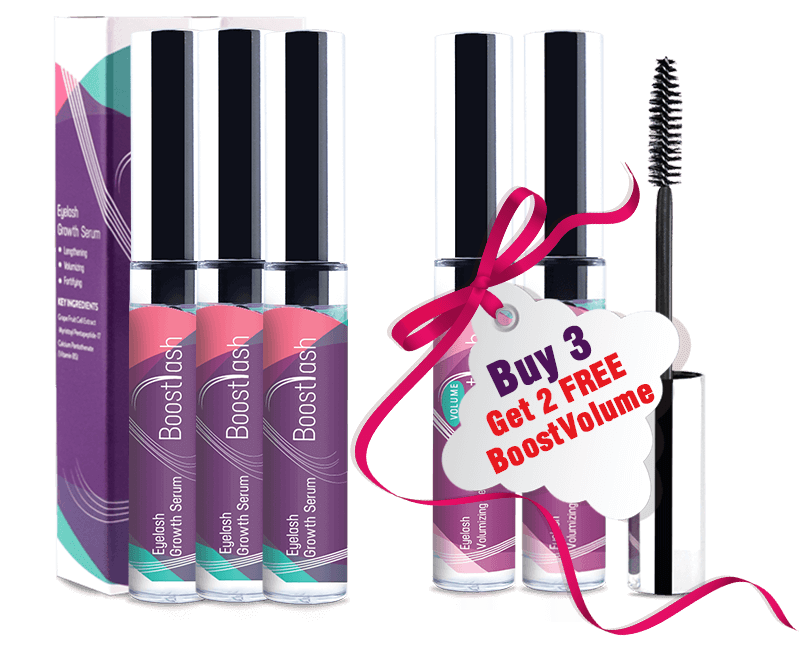 BoostLASH makes your eyelashes longer, fuller, darker and of course 3X healthier. 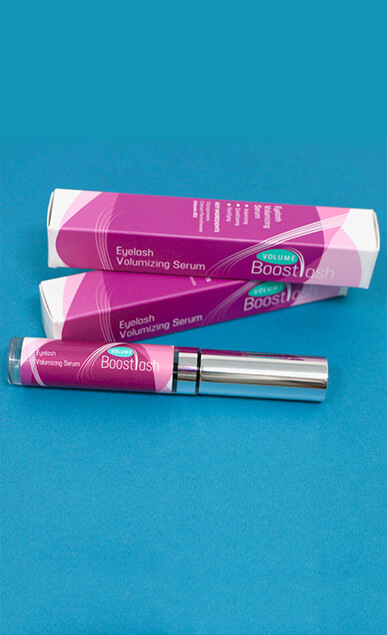 While BoostVOLUME works with BoostLASH to make sure you get the maximum results. 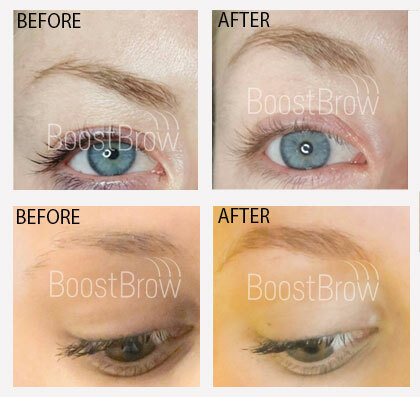 BoostVOLUME IS BEST IF USED IN COMBINATION WITH BoostLASH! 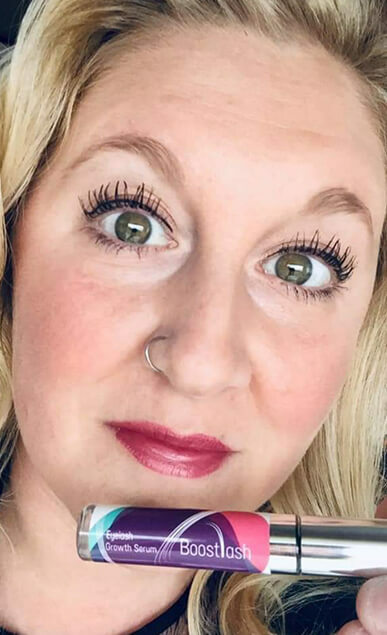 Apply mascara if you wish, why not? Rock your lashes and stay at the top of your game! 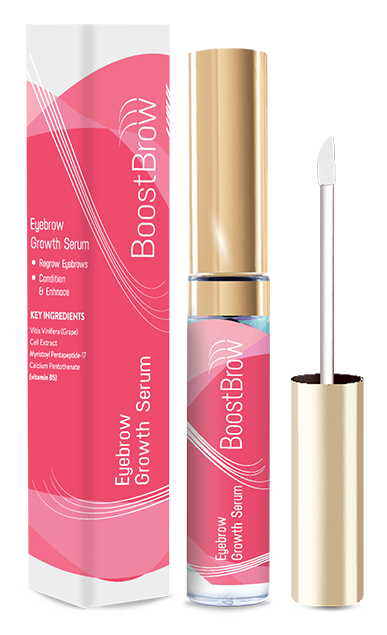 BoostVOLUME efficacy is due to its conditioning properties and antioxidants. 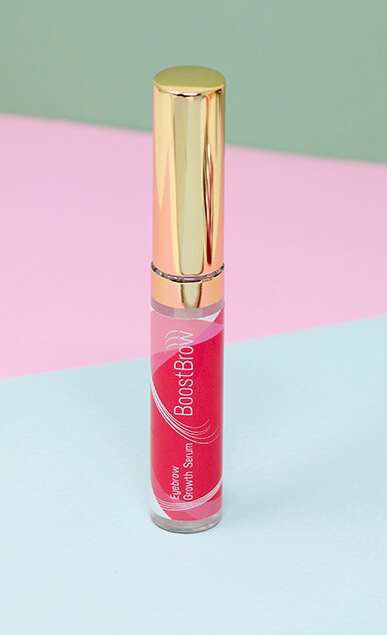 BoostVOLUME uses glycoproteins which gives it the ability to measurably thicken lashes, by creating a flexible,moisture retentive film on the yelashes. The glycoproteins provide the lashes with a fuller look, while also protecting them. 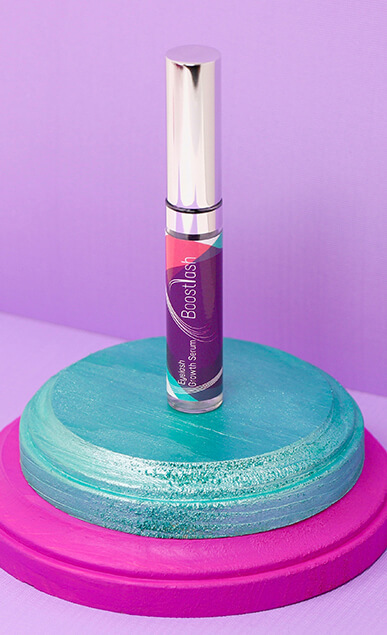 The conditioning property of BoostVOLUME delivers long-lasting hydration to lashes, which prevents them from breaking and nurtures eyelash growth. 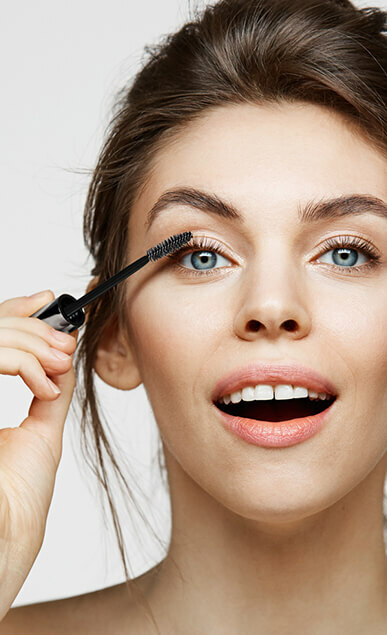 The healthier your lashes, the longer they will be. Specialists confirm that BoostVOLUME is safe, free of allergies and doesn't cause any form of irritation. Purified Water (Aqua), Hyaluronic Acid, Glycoproteins, Panthenol, Calcium Pantothenate, Phenoxyethanol, Ethylhexylglycerin. 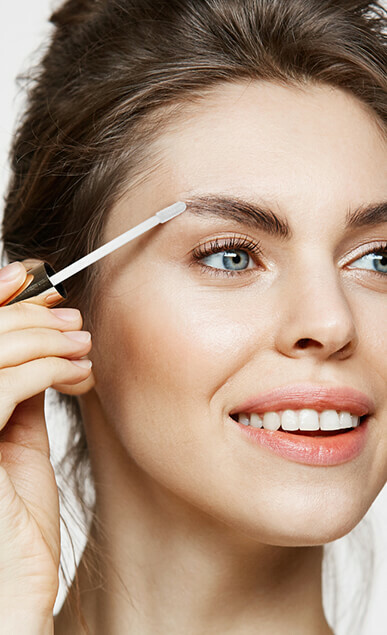 Get Darker & Fuller Looking Brows! & Primer All In One Bottle! THE PERFECT BUNDLE FOR YOU! 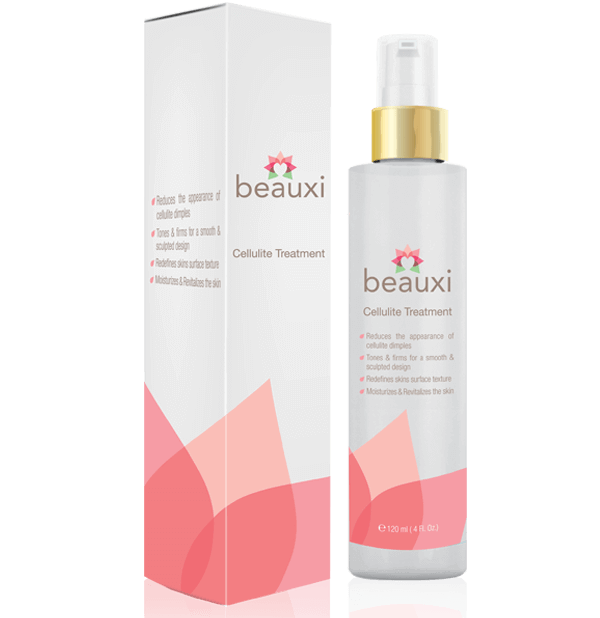 Get Rid of Cellulite & Feel more Confident! Boost the Volume & Shape of the Buttocks! I recommend this product, my daughter uses the eyebrow growth serum and i use the lash serum. We're both satisfied with the results. I'm glad that I came across boostlash. There are so many fake products out there that claim to have the best product, don't trust them. I've done it before and learned it the hard way. After using this product for 7 weeks I started to noticing a huge difference in the length and the volume of my eyelashes. I used the volume along with the growth serum as they recommended. Wish I could share the b/a pictures here, however I'll email them the pictures hope they will share it on this site. Very happy with my purchase. Much to my surprise Boostlash really worked for me. I'm over 70 years old and I can see my eyelashes growing and getting thicker. I'm glad I gave it a try, you won't be disappointed try it. Started using boost products 2 months ago. I can't say enough about these products, all three products work for me and I use the lash serum with the volumizer everyday. 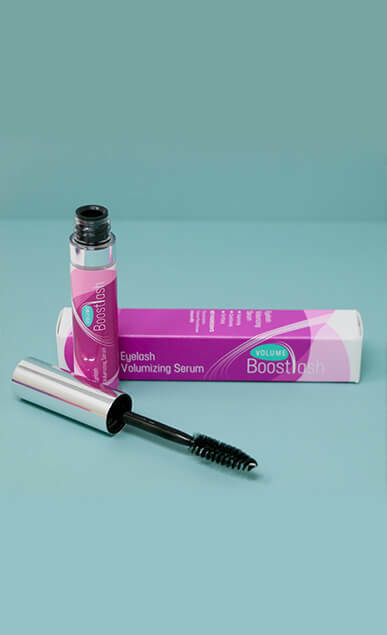 I use the volume before applying mascara and it defintely gives extra volume and it also helps with the growth of your lashes overtime(with the boostlash). I'm glad I found this brand, will purchase more for my daughters. Have tried couple other products before but I'm completely satisfied with the results I'm getting with boostlash. I recommend this product!!! After having used prescription Latisse in the past, I had high expectations and this product met them - for half the price. Love this product. Used another with no results. I am 76 yrs old and finally have thicker eyebrows and eyelashes. This is amazing for an older person. Brought this product to my eye Dr. And he approved it for me to use and I was assumed it was safe.By the way, I saw growth after 3 weeks. It is now 6 weeks. I am hooked! Puchased two bottles like a month ago and used one on my lashes, and one on my brows every night. I can definitely see improvements on the length of my lashes and can see hair growing back on the bald spots on my brows. This encourages me to keep using the product. I recently called them and told one of the customer service representatives that this product worked for me and I have recommended it to all my friends and family members. Almost every morning when I'd wake up to go wash my face, I'd notice 1-2 eyelashes falling out. Been using this product for a little over 2 weeks now & I'm not losing any eyelashes anymore. I am impressed with the results. This really helps me get the lashes I've always dreamt about. Will email them before and after images because apparently can't attach a file from this review section. Works, this is my 2nd order. I ordered 1 for my mom. When I run out I will most certainly purchase this product again. they were running a special last month and i mistakenly bought 2 bottles. I realized it after placing the order. I contacted them immediately and they took care of the problem in a timely manner. Thank You!!! The reason I'm giving 4 star is because I have tried to order this product twice and it was out of stock. Finally ordered, but they should have this in stock ALL THE TIME!!!! Will post the results on their insta! 34 days, using this product, sometimes twice daily and it has improved my eyelash thickness, length and they look healthy. They really do!!! When can I expect resultss???? After using this product for 10 days now, i only feel like my eyelashes are a bit thicker. but when can i see the final results???? I'm happy with the results! I'm super happy with the results:D I'm using boostlash for over one month now and the results are exceptional. I only use lash curler most of the time. I'm avoiding mascara these days until I see the full results. Have been searching for a good eyelash enhancer for months now. Eyelash serums are pretty expensive and most of them don't work. Came across boostlash couple of months ago. I think the price is very reasonable comparing to the quality of the product. It's affordable, and the bottle itself is sooo cute. I have started seeing my eyelashes grow back after losing most of them because of eyelash extensions. I highly recommend this product! This serum is worth every penny. I have a very sensitive skin, especially around my eyes. This serum did not burn or irritate my eyes, it actually smells good and leaves my eyelashes soft and conditioned afterwards. Will keep using it and will email them the results hopefully they will share it on their website. I'm in week 2 and I can see slight changes in my eyelash length however I haven't noticed any drastic changes. Well, since they don't claim changes overnight I'm okay with the existing results for now. Too soon to jump to conclusions I guess. I am impressed with this product, it's the only enhancing serum that does not irritate my eyes. I have tried couple of other serums before and this one works the best for me! I like this product. It is working! My lashes are longer and darker and it doesn't irritate my eyes. Good stuff!! Exactly what I expected for a great price! I'm not sure why but this product did not work for me. 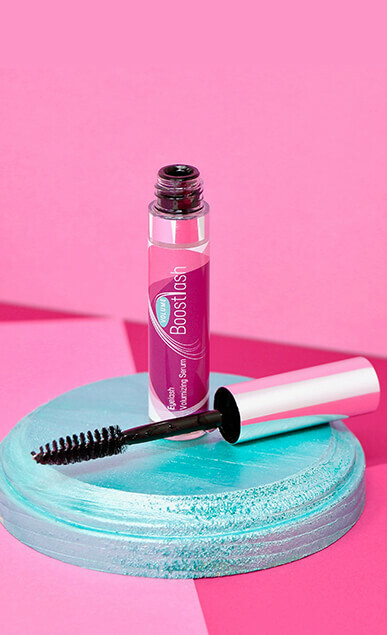 I've been using boostlash for about 5 weeks now and am definitely seeing an increase in my eyelash length and my eyebrows are fuller now than before. It seems to be helping. I plan to continue to using it. A friend recommended this & so far so good! Still using this product, but it's been the best enhancer I've ever used. My eyelashes and brows look thicker and bolder. Love this! It's ok, I see some difference, but not a huge difference. They don't promise changes overnight or in 10 or 15 days. Sick and tired of empty promises other eyelash growth serum companies make. Decided to give boostlash a try and see how it works. For me this product worked like a charm especially on my eyelashes. 4 stars because I couldn't find the directions on the box. Checked their website to find out how to use it properly. When will you run a special again? I bought 3 bottles package couple of months ago and can't find that deal again. Help!!! Love how my eyelashes look when applying mascara. I'm not using eyelash curler anymore which also prevents my lashes from falling out. Happy! 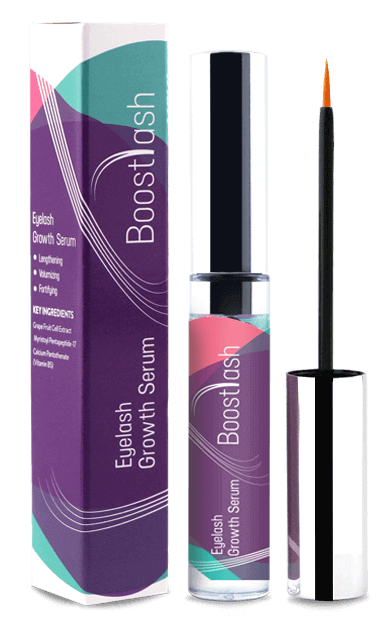 Boostlash has been at the forefront of driving highly effective eyelash growth serum production. 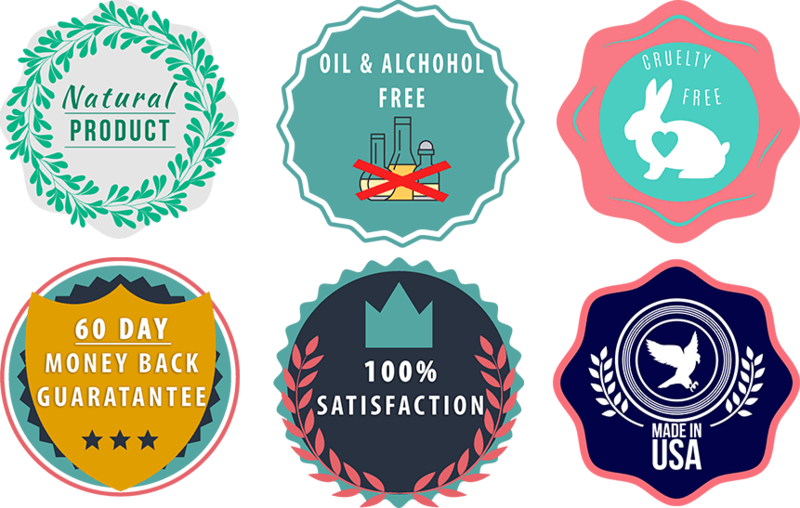 Our company stands behind our values of integrity and excellence! Having built a unique manufacturing plant in the US, we have been able to spread our influence to serve various international markets, and the results have had a positive impact on thousands of people! © Copyright 2017-2019 boostlash.com. All Rights Reserved.